Attempting to out-predict the BBC predictor and in some cases failing miserably. We have only had six weeks so far, so if we equate this challenge to a 38 lap race (9.5 miles on a running track), then we have only completed 1.5 miles so far. We therefore have a long way to go, but the field is already beginning to be stretched. Rich is obviously intent on running the sprint finish out of the other two by setting a fast pace and has already opened up quite a lead. But has he set off too quickly? We all remember the tale of the hare and the tortoise. On the BBC website Lawro has now lost two of his six weekly prediction encounters. Firstly he was beaten by WWE star and Hollywood actor, Dave Bautista, who hadn’t heard of some of the Premier League teams, and then last week it was the turn of the world number one darts player, Michael van Gerwen to beat him. To boost his confidence this week they’ve put him up against comedian and actor, Elis James. James took part last year and only got one result and no scores correct to give him the honour of being the lowest scorer in the whole season. Cheating a little now as we compile the alphabetical Hammers challenge. What began as a cure for insomnia on warm summer nights has begun to turn into a bit of an obsession. It all started with me trying to select teams of West Ham players whose surnames all started with the same letter. I’ve picked six to date, “B”, “C”, “D”, “F”, a combined “G” and “H”, and “Vowels”. Moving through the alphabet my next letter was J, and I managed to write down 10 names including two keepers. The letter “K” was slightly easier and I managed to write down the names of 13 players. But I was worried about the strength of team I could pick from these two combined, so I wrote down all the “L”s I could think of and managed 14. Putting all three together I reckon I have a team to match any of those previously picked. So who are some of the notable names omitted? Jaaskalainen, Kurucz, Leslie and Lama are four keepers, plus Jenkinson, Jacobsen, Roger Johnson, Jimenez, Jarvis, Steve Jones, Kirkup, Kilgallon, Kitchener, Keen, Kovac, Robbie Keane, Kanoute, Keeble, David Kelly, Lindsay, Lazaridis, Lansbury, Llungberg, Lutton, Rob Lee, Elliott Lee. I remember seeing all of those at one time or another; some were better than others! But, perhaps I’ve forgotten someone really good. Can you pick a team of J/K/L surnames to rival mine? I reckon one or two of my generation would have had Vic Keeble in their side, although I suspect not too many would select Roger Johnson or David Kelly, or even Robbie Keane on his performances for us, although he certainly had some career playing for others plus internationally. And who would manage the J/K/L’s? There’s only one candidate I believe, John Lyall. Remembering Adam Newton star of the FA Youth Cup winning team of 1999. The West Ham Under-19 side of 1998/99 swept all before them in claiming a spectacular league and cup double. The climax to the season was the two legged FA Youth Cup Final against Coventry City. The Hammer’s opened up a healthy 3-0 advantage in the first leg at Highfield Road and yet 21,000 supporters still turned out to watch the return at Upton Park a week later on Friday 14 May 1999. It took only a few minutes for West Ham to extend their lead and they eventually ran out 6-0 winners on the night (9-0 on aggregate). Expectations were high for a new golden generation arising at Upton Park. Apart from the obvious talents of Joe Cole and Michael Carrick there were other promising players including Izzie Iriekpen, Richard Garcia and, in particular, Adam Newton. It is full/ wing back Adam Newton who is the subject of today’s The Boy Never Quite Made It feature; although there are plenty of other candidates from that side. Newton had scored in both legs of the Coventry final. In the first a delightful chip over the head of the advancing Chris Kirkland and in the second an exciting run topped off with a ‘sumptuous’ strike past the stationary keeper. In many ways Newton was the star of the show even overshadowing the better known Cole and Carrick duo. There were even rumours of a million pound bid from Spurs shortly after the final. At the start of the 1999/ 2000 season Newton had a brief loan spell with Portsmouth before returning to Upton Park for his West Ham debut in August 1999; a substitute for Marc Keller in an away defeat to Coventry City. A week later he made another substitute appearance (this time for Trevor Sinclair) in the 3-1 UEFA Cup victory over NK Osijek of Croatia. He made his final West Ham appearance in April 2000; again as substitute (for Scott Minto) in the 5-0 home win against (surprise!) Coventry City. Harry obviously regarded Newton as a Coventry specialist. The following two seasons were spent out on loan at Notts County and Orient before being given a free transfer to join Peterborough United in May 2002. Newton spent six seasons at Peterborough in the Second Division and although they won promotion at the end of the 2007/08 season his contract was terminated. Born in Grays, Newton had represented England at U21 level but became a full international for Saint Kitts and Nevis during his time with the Posh. The following season Newton signed a one year deal with Brentford and helped them win the Division Two title in 2009. One more, however, his contract was not renewed and he moved on to Luton in the Football Conference. Two years at Luton ended with a Play Off final defeat, no new contract and his final move to Woking in the Conference South. Adam Newton appeared to have all the attributes to make it to the top at West Ham; skill, speed and athleticism. Sadly, it just didn’t come together for him and he is one more bright hope from the academy that never quite made it in the first team. English footballers missing in action. When West Ham took the field in the EFL Cup Tie against Accrington Stanley there were no British players in the starting eleven. By the end of the game a total of 14 players had been used of whom only Michail Antonio was British. I have to admit that I am not sure whether West Ham have started with an all non-British line-up in the past but it seems unlikely. However, as long ago as 1999 Chelsea had become the first English side to field an all foreign starting eleven. I was also surprised a few weeks ago when I happened to come across the line-ups for the Championship fixture between Aston Villa and Nottingham Forest to discover that only 8 of the 27 players featuring in the game were English. It has become accepted that Premier League squads were dominated by overseas players but it hadn’t occurred to me that the same was the case in the second tier. So I decided to take a closer look. There had been the occasional foreign player appearing up in English football ever since Max Seeburg from Germany turned out for Tottenham in 1908. After a spat with Arsenal over the signing of foreigners and obviously worried by a growing trend the FA introduced a 2 year residency rule in 1931 which served to stem the onrushing tide at the time. Even so, foreign players appeared in each of the FA Cup finals between 1951 and 1956 with one of these, Bert Trautmann becoming Footballer of the Year in 1956. In 1978 a European Community ruling declared that football associations could not deny access to players based solely on nationality and, as a result, the effective 47 year ban in England was lifted. The arrival of players such as Ardiles and Villa at Tottenham spearheaded the new foreign invasion. At the time various quotas on non-British players applied but these have long since disappeared. When Arsenal won the league in 1989 they were the last team not to use a single foreign player (for the picky, yes the squad did include David O’Leary and Niall Quinn; both from the Republic of Ireland). As far as I know, the first foreign player to play for West Ham was Clyde Best who I assume qualified to play under the two year residency rule before getting a first start in 1968. An attempt to sign Israel skipper Mordecai Spiegler after the 1970 World Cup was thwarted by the red tape still in play at the time. After the 1978 ruling West Ham were relatively slow on the uptake with the first overseas player, Francois Van der Elst, not clearing customs until January 1982. By then everyone was in on the act and even second division Charlton had signed former European footballer of the year Allan Simonsen from Barcelona. In 2013, West Ham had become the first English club to have fielded players of 50 nationalities; the majority of whom, it has to be said, barely made an impression. I spent some time going through squad lists to see how teams in the Premier League and Championship currently shape up with regard to foreign players. For the purposes of the analysis I have used the squads listed on Wikipedia. Players are categorised on their FIFA registration and I have treated players from the Republic of Ireland as foreigners (possibly harsh seeing as any English player who has seen Riverdance more than once is probably eligible to represent the Republic). In the Premier League, 60% of players are foreign. Watford are top recruiter with 84% of their squad hailing from overseas. At the other end of the spectrum, Hull and West Brom have only 25% foreign representatives. The top 6 clubs for foreign players are Watford (84%), Manchester City (81%), Chelsea (76%), Arsenal (72%), West Ham (70%) and Sunderland (69%). If you were to exclude players fro the other Home nations the percentage of English players overall drops to 35%. The top 6 origins of Premier League players are England, Spain, France, Belgium, Republic of Ireland and Netherlands. In the Championship, 40% of players are foreign. Newcastle and Reading are joint top with 62% followed by Brighton (54%), Fulham (54%), Brentford (52%) and Nottingham Forest (51%). Two more teams have at least 50% of overseas players. Rotherham brings up the rear with a mere 16% foreign contingent. There has been a long running debate about the impact of the foreign invasion on the fortunes of the national side. In that we have just the single 1966 tournament victory to show for a period both before and after the invasion then you could make a case that it is neutral. However, it does raise the question of what happens to all the kids who dream of becoming a professional footballer. Many of us had that dream at one time living out the fantasy over the park, even without the lure of the vast financial rewards of today, but at least for some the dream came true making it into teams that were largely home grown. Sure squads are much larger now but my instinct is that if we looked at game time the proportion for foreign players will be even higher (in the 6 Premier League games to date 78% of West Ham starters have been foreign players) than that for the squad as a whole. I will delve deeper into this at another time. With all the recent revelations about shady deals between managers and agents let’s hope this is not a contributing factor to the skewed make up of English club squads. Was there some truth to Ravel Morrison’s claim as to why he was banished to the reserves at West Ham? The Premier League is a worldwide phenomenon which has been enriched by foreign players; there is no getting away from the fact that the most exciting and flair players are from overseas. The multi-million dollar question is why this is the case? Are the local lads not up to the challenge? Would they rather chase Pokemon than a football? Have we not sorted out grass roots youth development despite Sir Trev’s best efforts? On those occasions that I have seen kids football they all seem to have mastered the Cruyf turn and the Rabana but not the basics. For now, the mystery of the disappearing English footballer deepens. A special supplement looking at events in September 1998. Geoff writes some excellent features that look back on specific weeks in West Ham history. I hope he doesn’t mind if I add to this week’s article which was posted on September 26, as I have personal memories of the long weekend (in football terms) that stretched from Thursday 24 September to Monday 28 September in 1998. That is eighteen years ago. So anybody born in that week is now able to do various things legally that they weren’t supposed to beforehand. And I personally know somebody who had their 45th birthday on September 27 that year, and who therefore celebrates their 63rd this week. Happy birthday Mr. H.
The weekend in question is what might be termed Premier League Matchday 7 nowadays, although I don’t think the phrase existed at the time. So every team had played 7 games at the end of the weekend, except for Manchester United and Chelsea who had only played six for reasons that I cannot recall. Manchester United beat Liverpool 2-0 in the Thursday game in front of the weekend’s biggest attendance of just over 55,000. Aston Villa beat Derby 1-0 to open up a five point lead at the top of the table with five wins and two draws in their seven games. Incredibly (for a team well on top) they had only scored eight goals and conceded just one. This was the first defeat of the season for Derby, who were in second place, and they too had very few goals in their games, with just six scored and three conceded. There were far fewer goals scored at the beginning of the 1998-99 season compared to today. 153 goals had been scored in 69 matches. This season there have been 176 goals in just 60 games. Only one of the ten games that weekend produced more than 2 goals (a 3-3 draw between Tottenham and Leeds). This year, last weekend had 7 matches where three or more goals were scored. Aston Villa were top, Derby were second and Wimbledon third, (with West Ham fourth). Other Premier League teams included Newcastle, Leeds, Sheffield Wednesday, Charlton, Forest, Coventry and Blackburn. 50% of the teams in the league 18 years ago are no longer in the top flight. To further illustrate the changing nature of teams at the top, five of those teams who are not currently in the Premier League have been champions in the top flight of English football in the last forty-five years. I remember the weekend for two particular reasons. Firstly, I was at Upton Park for our game which featured as the Sky Monday night football. Just over 23,000 were there to witness us beating Southampton (who were rooted to the bottom with just one point at the time) by 1-0, with an Ian Wright goal in the second half. Compare that to the attendance for our game against Southampton on Sunday! But the most remembered aspect of that weekend was in the game at Hillsborough where Sheffield Wednesday beat Arsenal 1-0 with a late goal. A certain Mr. Di Canio got in an angry exchange with both Patrick Vieira and Martin Keown. The referee, Paul Alcock, sent off Di Canio, who was so angry he pushed the official, who then fell theatrically to the ground. The red card (and of course the push) led to Di Canio receiving an eleven match ban. This was effectively the end of his time at Wednesday, and early in 1999 Harry Redknapp took what many considered to be a massive gamble, and brought Di Canio to Upton Park. In the four years he spent with us he became an Upton Park legend. And how did the season end? Southampton, who were five points adrift of safety when we beat them, avoided relegation. Perhaps our situation is not as critical as the doom-mongers amongst our fans would have you believe after our poor start this season? Villa did not hang on to their big early season lead and finished in sixth place, 24 points adrift of Manchester United, the champions. Derby fell to eighth, and Wimbledon fell dramatically from third after seven games, to finish fifth from bottom. We had what still remains as our best ever Premier League season finishing in fifth place. Not quite as impressive as our 1985-86 third place in the top flight, but our best ever finish since the inception of the Premier League which has been going for around 25 years now. As a result we qualified for the Intertoto cup, and our success in that meant we went on to the UEFA Cup where we were eliminated by Steaua Bucharest of Romania. What is it about Romanian teams? Incredibly for a team finishing in fifth place, Ian Wright was our leading scorer for the season with just nine goals. Following the end of the season he never played another league game for us again, going out on loan to Forest and then finishing his career at Celtic and Burnley. But it was the events at Sheffield Wednesday that weekend that were to have a significant impact on the history of West Ham, especially for the following four years. More difficulty starting than an Austin Allegro! 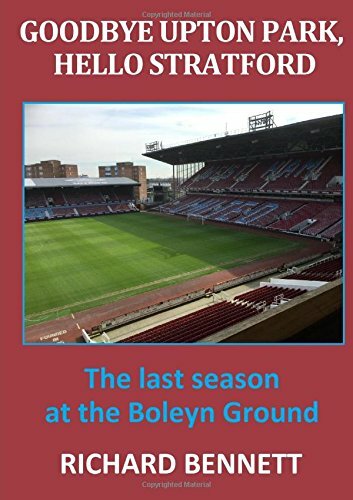 Following on from my “Don’t Press the Panic Button” article, for any readers that are younger then me (and most will be), I thought I would relate my “beginning of each season” experiences as a young supporter of West Ham in the 1960’s and 1970’s. Traditionally, of course, we have always had a reputation for performing badly in the second half of the season (down with the Christmas decorations? ), but how did we fare in our opening games? I’ll start with the 1965-66 season. I was eleven years old and had been at Wembley when we had just won the European Cup Winners Cup in May, after winning the FA Cup the season before that. Hopes were high that we would push on in the league. So what happened? We won just one game out of the first eight (a 2-1 victory over Leeds who were to finish runners-up at the end of the season). Five of those games were lost, including three consecutive games (two of them at home!) in one nightmare week where we conceded five goals in each of them (15 in total!). How could we possibly recover from that? I’ll move on to the following season, 1966-67. England had just won the World Cup and, as we all know, West Ham were very instrumental in that. Hopes were high once again. So what happened? This time we won just one of our opening seven games, including defeats in the first three. How could we possibly recover from that? The next season, 1967-68, we won just one of our first six games, conceding 18 goals in the process. Four of the games were lost. How could we possibly recover from that? Let’s move on to 1969-70. We won our first two games to go top of the league, and then didn’t win any of the next seven, including five defeats, to plummet almost to the bottom. How could we possibly recover from that? The following season (1970-71) we were at it again. This time we didn’t win any of our first ten league games. That’s right, ten games, no wins! How could we possibly recover from that? Moving on to the following season (1971-72) we lost our first three games and drew the fourth 0-0. One point, bottom of the league, and not a single goal scored. How could we possibly recover from that? By 1972-73 we were improving very slightly in our early season performances. This time we incredibly managed to win two of our opening seven league games, which included three consecutive defeats. How could we possibly recover from that? But by the following year (1973-74) we were back to our old opening form. We didn’t manage to win a single match out of the first eleven league games played, drawing four and losing seven. We were bottom of the league at this point. How could we possibly recover from that? And finally 1974-75, the season that ended with us winning the FA Cup. We won just one of our opening seven league games, and at this stage once again sat rock bottom of the league. How could we possibly recover from that? The observant readers among you will have noticed that I missed a season out. Nine seasons out of ten we had dreadful starts. But one year was an exception. In 1968-69 we only lost one of our first eleven league games and were challenging at the very top. So there you are, ten consecutive seasons taking me from age 11 through to age 21. In nine of the ten our start was equivalent to what we’ve seen this year. So which of the ten seasons do you think we finished highest in the league? Just looking at the bare facts you would probably opt for 1968-69. But you’d be wrong. In 1972-73 we finished in sixth place. And for all those poor starts, how many times did we get relegated in those ten seasons. That’s right, we didn’t. Not once! And what about all the excuses that are being put forward for our poor start to this season? Did they apply then? Time and time again I keep hearing the same thing. Our poor start wouldn’t have happened if we hadn’t moved to a new stadium. Well as you know, throughout those ten seasons we played at Upton Park. Fans citing that as an excuse for our poor start this year need to remember that Upton Park was not always the intimidating fortress that they remember. Yes, our start is disappointing, especially after all the optimism following last season. Perhaps we set our expectations too high? The performances have been poor though. Throughout the years that I covered above we had players of the calibre of Moore, Hurst, Peters, Brooking, Bonds, Byrne, Boyce, Lampard, and Pop Robson. And we played at Upton Park! But we still had some appalling starts to seasons and recovered. “Don’t Panic” is a Coldplay song. “Don’t Panic” is a famous phrase from The Hitchhikers Guide to the Galaxy. “Don’t panic” is one of Lance Corporal Jones’ famous catchphrases from Dads Army. “Don’t panic” is my message. We’ve been there so many times before. I could be wrong but give it a bit longer. I’m confident we’ll be OK.